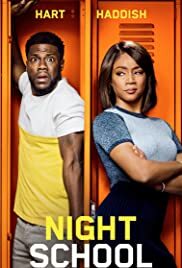 Night School, a comedy starring Kevin Hart and Tiffany Haddish, delivers exactly you would expect from a comedy starring Kevin Hart and Tiffany Haddish. It peppers in plenty of jokes, some hit while others miss so badly that they can hardly be recognized as attempts at humor. There's such an eclectic mix of silly, sweet and ridiculous that's the result of six writer patching together the script. It easily could have been a disaster if not for the talented ensemble of on-screen talent. Girls Trip director Malcolm D. Lee once again displays his aptitude for letting Haddish showcase her personality. She is equally a force when imposing her gruff edge and when showing her softer side as a no-nonsense teacher who leads the night school class for those prepping for the GED. That's where she meets Hart's character, Teddy, a serial hustler in life who lost his sales job and now must pass the GED to begin a new job in finance and impress his successful fiancé. Everyone in the night school class has their own reason for being there, but I question the logic of it all in 2018 because their desired career opportunities would be more likely to require a college education than only high school. 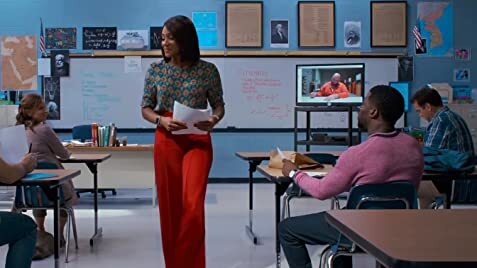 Nevertheless, Hart's classmates include a mom who got pregnant in high school (Mary Lynn Rajskub), a oddball conspiracy theorist (Romany Malco, who is hilarious in his limited role), and large man who is an even larger doofus (Rob Riggle), to name a few. Give Riggle credit for his commitment. He consistently pours his heart into every line with the sincerest of effort, even the ones he must have known had no chance at eliciting even a chuckle. Some of the other performers have more to work with but each achieves maximum laughs from the mediocre material. The jokes mostly come from the most obvious places, which comes across as lazy writing. There's about three too many sight gags, one of which is admittedly hilarious despite being disgusting to point that it's impossible not to look away. The other physical humor ploys, including over-the-top comic violence, grow tired quickly. The script hits the pause button on jokes, it unveils a heart beneath it all. These tender moments aren't exactly masterful, more like gooey to the point just shy of eye-roll worthy. But them credit for trying. All considered, this movie earns a passing score that could have been better if the filmmakers had just put in a little more work.